Coaches will depart daily at 8.30 am. You should be at the meeting point at least 20 minutes in advance of departure time. Day trips to Neuschwanstein and Linderhof Castles operate all year. These attractions can be very crowded during the summer months and public holidays. We are comparing Day Trip to Neuschwanstein and Linderhof Castles from Munich Prices from leading ticket suppliers and Try to find you Cheap tickets prices on the market. This full-day Bavarian adventure to 2 of the regions most impressive castles and best preserved historic towns will begin outside of Munich's main train station. Here you will climb aboard a luxury air-conditioned coach and meet your bilingual tour guide. As you travel further from the city you will notice the landscape becoming increasingly beautiful, driving on a scenic road between mountain until you reach Linderhof Castle. This is the smallest of the 3 Royal Castles that you will see today and also the only castle which was completed before the death of the ‘mad' King Ludwig II. Famous for is many quirks and whims Ludwig ordered this castle to be constructed in a style partway between French Rococo and Moorish. You will have 1 hour at Linderhof, with the options to visit the interior, before continuing Oberammergau. In the afternoon you will take a break in the town of Hohenschwangau and see the second Royal Palace on the Royal Palaces day tour. The historic town sits below the illustrious Neuschwanstein Castle and you will have the choice of joining a guided tour of the castle or enjoying free time to explore the forest walking trails, visit Pollath Waterfall and the gorge, or relax in one of the many locally owned beer gardens. This is a full and exciting day tour which combines nature with history and culture, therefore it should appeal to a range of people, particularly history lovers and visitors who would like to see the highlights of Bavaria without the trouble of organising independent transport. This tour is suitable for groups, families or individuals and is appropriate for children. People with walking difficulties may have difficulties visiting the castles. Your Experience With Day Trip to Neuschwanstein and Linderhof Castles from Munich? Take a day away from the Munich city centre to explore the Bavarian Alps and region Royal Castles. See Neuschwanstein Castle, a castle famously featured in Chitty Chitty Bang Bang and inspired Disney's Sleeping Beauty Castle. Admire the mixed architectural styles of Linderhof Castle. Visit the historic villages of Oberammergau and Hohenschwangau. Travel stress-free on an air-conditioned coach with a professional bilingual guide. What Day Trip to Neuschwanstein and Linderhof Castles from Munich Includes? Round trip transportation by air-conditioned coach from Central Munich. Munich Central Station (Hauptbahnhof) – Linderhof – Oberammergau – Neuschwanstein/Hohschwangau – Central Munich. 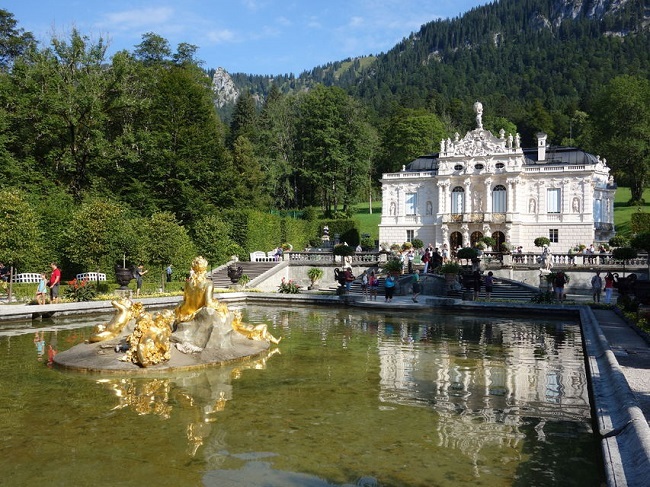 This tour only stops briefly in the town of Oberammergau, therefore if you would like to visit the ‘Venus Grotto' you may prefer to book the ‘Royal Castle of Linderhof and Oberammergau day tour' with Viator. Travelers Reviews about Day Trip to Neuschwanstein and Linderhof Castles from Munich? The Royal Palaces full-day tour from Munich is a bestseller with an impressive 4.5-star rating from TripAdvisor contributors. Comments mentions that this is a fairly long tour, at over 10 hours, however, this is unavoidable as the castles are located quite far from Munich. Comments are overall positive, praising the tour company and guides. Comments from parents say that this is a good tour for children. Please have your printed or mobile ticket to show to your tour guide. Tickets are fully refundable up to either 24 hours in advance (Get Your Guide) or 7 days in advance (Viator). Late cancellations will be charged a 50%-100% cancellation fee. This is a bilingual tour which will be conducted in English and German. Multilingual audio guides are available inside the castle and on the bus in French, Italian, Portuguese, Spanish, Russian, Chinese, and Japanese. To reach the entrances to the castle a moderate amount of uphill walking is required, therefore we recommend wearing comfortable walking shoes and appropriate clothing. Entrance fees to the castle are not included in the ticket price, tickets can be purchased on the day through your tour guide. Meeting Point: Outside the Kardstadt Shopping Centre, located on Bahnhofplatz opposite Munich's main train station.